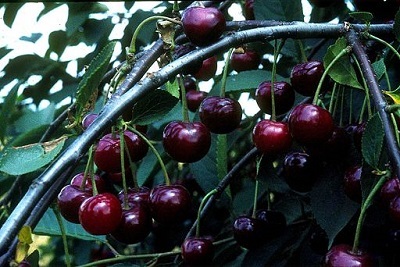 In English we usually discuss cherries in the plural, but in Russia one usually discusses them with a singular noun that indicates a mass of berries, so in the following examples you will notice that the English plural always corresponds to a Russian singular. — Сколько вишни ты купила? Фу, вишня протухла! Yuck, the cherries have gone bad. — Варю компот из вишни. In the last example we saw two ways of saying ‘cherry punch.’ The first way used a noun followed by a prepositional phrase: компот из вишни. The second turns the word вишня into the adjective вишнёвый, thus we get «вишнёвый компот». — Меня вчера избил какой-то «новый русский» в вишнёвом костюме и золотых цепях. By the way, if you would like a little introduction to the generaly style of the New Russians, I recommended this page and this page. Don's addition: Those suits were often called малиновые костюмы ‘raspberry-colored suits’ as well. My favorite fruit is the strawberry- клубника. When I was a very young girl in Russia, we had a neighbor who used to grow them in her yard. So my love of the red berry developed early. I will admit to being picky and preferring things with real strawberries over anything that is strawberry-(shudder)flavored. У меня так много клубники, что нет места в холодильнике. I have so many strawberries, that there is no room left in the refrigerator. I am also quite convinced that any dessert is improved by adding strawberries to it. For example, Crème Brule with a fresh strawberry on top is heaven. Crème Brule is better with strawberry. And there is nothing in the world like a fresh strawberry dipped in some high-quality dark chocolate. Yum! Я не могу жить без клубники. I can't live without strawberries. Amazingly enough, conversational Russian has a couple of other words that mean “a single berry of the type клубника,” and they are клубничка and клубничина. Thus one can say одна клубничина, две клубничины, одна клубничка, две клубнички. If I had one raspberry, I would say «у меня одна малина» "I have one raspberry". 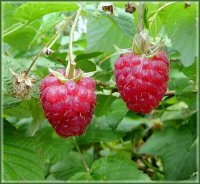 However, if I have more than one raspberry, I would use the plural term for raspberry (малины) and say «у меня две малины» "I have two raspberries". The Russian word for strawberry is клубника. 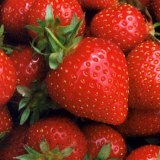 Another word for strawberry is земляника. Земляника grows in forests and is smaller in size than a store-bought strawberry but it still has the same taste and texture. As a child, I enjoyed picking strawberries with my grandmother and parents. We took large baskets with us and spent many hours picking strawberries and enjoying ourselves. At the end of the day, we walked home with baskets full of strawberries and at home my family used some of these strawberries to make strawberry jam. Today, I tell everyone «Я любила делать варенье из земляники» “I loved making jam out of strawberries.” I enjoy shopping for strawberries today because it brings back memories of me picking strawberries with my family.